The film masterfully contrasts footage of captive whales swimming lifelessly around concrete tanks with footage of wild orcas swimming strong and free, their dorsal fins standing tall, instead of flopped over in defeat. Those who watch the moving film are sure to never shell out the $60-plus for a park ticket again, and this may be what activists need to close SeaWorld's doors for good. In 2011, SeaWorld Parks and Entertainment had a banner year with core earnings topping $380 million. But for decades animal activists have been arguing that this is blood money. Blackfish, a new documentary about the well-known theme park, finally might prove them right. Directed and produced by Gabriela Cowperthwaite, the film follows the story of Tilikum, a baby orca captured in the open North Atlantic Ocean in 1983. He made headlines in 2010 when he caused the death of senior SeaWorld trainer Dawn Brancheau. As the documentary leads you through the events leading up to Brancheau's death, it takes the opportunity to look at the larger issue of whale captivity and the wide net of negligence and corruption SeaWorld has cast as it consistently put its animals and staff in danger to make a profit. Blackfish utilizes interviews from a variety of reputable sources, including former SeaWorld trainers and whale researchers to compile evidence against the marine park. "The situation with Dawn Brancheau didn't just happen; it's not a singular event," whale researcher Dave Duffus explained. "You have to go back over 20 years to understand this." John Crowe recalled his whale hunting in 1970 in Puget Sound, Washington, and how haunting the mothers' cries were as he separated the babies from the pod. "I lost it. I just started crying. I just couldn't handle it," he said in the film. "Just like kidnapping a little kid away from her mother. I can't think of anything worse than that. The worst thing that I've ever done is hunt that whale." Tilikum, affectionately nicknamed Tilly, was captured and separated from his mother when he was only 2. In the wild, orcas never leave their mothers, and some of these pods can have as many as four generations traveling together. Once captured, Tilikum was purchased by Sealand of the Pacific in Canada and taught to perform tricks for crowds of people. The trainers utilized punishment such as food deprivation to teach him the tricks. When the crowds left at night, he and two other whales were locked in a 20-by-30-foot metal container in complete darkness for 19 hours until the next day's shows began. The physical trauma he suffered, in addition to the emotional distress of being separated from his family and the ocean, took its toll on Tilikum. Ken Balcomb, director of the Center for Whale Research, said this was "not only inhumane, but it probably led to a psychosis. He was on a hair trigger - he'd kill." In 1991, Tilikum made his first kill after a trainer slipped and fell into the water. Two Sealand patrons witnessed the event and recalled Tilikum's dingy pool-like tank. "It was an amusement park that was kind of on its last legs, and everything was a bit gray," Corinne Cowell remembered. The sisters watched in horror as trainer Keltie Byrne fell into the pool and tried to escape only to be dragged back in by Tilikum. "It was the large whale, Tilikum, that went after her. We knew it was that whale because he had the flopped-over fin [that the two female whales didn't have]," said Nadine Kallen. After the tragic event, Sealand closed - but not before making millions of dollars by selling the whale to SeaWorld. Despite his dangerous past, the park placed the whale in its Orlando, Florida, theme park. SeaWorld was well-established at this point and also had parks in San Antonio and San Diego. Former Sealand trainer Christopher Porter remembered thinking that Tilikum would have a better life at SeaWorld, with its highly trained staff, larger pools and what he thought to be vast expertise and knowledge. "So it was like, 'OK, Tilly, you're going to Disneyland. Lucky you,' " Porter said. But that was nothing more than a well-developed PR delusion. "I always thought you'd need a master's degree in marine biology to be a trainer," said one former trainer. "Come to find out it was really more about personality and how well you could swim." Samantha Berg, a trainer at the park when Tilikum arrived, said she and the other staff members were not given the full details on Tilikum, nor his hand in Byrne's death. "I was under the impression that he had nothing to do with her death," she said. But she did notice inconsistencies in what management was saying and how they acted around the whale. "Management seemed to think there was some reason to exercise caution around him. Clearly they knew more than they were telling us." She said, "I believe it's 70-plus, maybe more, just killer whale-trainer accidents. Maybe 30 of them happened prior to me actually being hired at SeaWorld, and I knew about none of them." As the film progresses, viewers learn not only about Tilikum's hand in trainer tragedies but also the many accidents and deaths other captive orcas have caused. It's worth noting that there is no record of a wild orca ever killing a human. A lawsuit filed in 2012 against SeaWorld on behalf of the Occupational Safety and Health Administration brought new evidence to light about the inherent dangers of working with these captive whales. Video footage from a 2008 orca attack on senior trainer Ken Peters surfaced and added more fuel to the anti-captivity fire. Blackfish utilizes rare footage from former trainers and footage taken from tourist cameras to paint a complete picture of the dangers of interacting with captive whales that could treat their trainers as toys. Blackfish also opens up SeaWorld's blatant lying at its parks that it deems "educational." The documentary consults several whale experts who explain that in the wild, orcas live as long as humans do. But then the video cuts to several SeaWorld employees stating that the captive whales actually live longer than wild whales. "Because the whales in their pools die young, they like to say that all orcas die at 25-30 years," said Howard Garrett, an orca researcher. "Every other potentially embarrassing fact is twisted and turned and denied one way or another." It's shocking to watch SeaWorld's misinformation on basic facts such as life expectancy and dorsal collapse. SeaWorld claims orcas' top fins droop about 25 percent of the time, when in reality less than 1 percent of wild orcas experience this affliction. But 100 percent of captive male orcas have collapsed dorsal fins. Blackfish exposes these lies and is sure to discredit SeaWorld's party line that their parks need to stay open because they educate people about these animals. "I spewed out the party lines during shows; I'm totally mortified now," said former trainer Carol Ray. She recalled telling audiences that their whales preformed tricks because they wanted to, not because they had to. "Like some of the things I said I'm embarrassed by. So embarrassed," Ray said. Former trainer Dean Gomersall echoed this sentiment: "There's so many things that were told to us that they tell you so many times that you start believing them. I was blind." "I really bought into what they told us," Samantha Berg said. In the end, for SeaWorld it came down to preserving the high profits these parks produced - at any cost. SeaWorld is no stranger to not playing by the rules. In 2011, it famously paid nothing in taxes despite a record-breaking year. Despite repeatedly declining the chance to be interviewed for the film, the marine park is now finally acknowledging Blackfish. In a letter issued to film critics on July 12, 2013, SeaWorld urged them not to believe the film, stating it was "shamefully dishonest, deliberately misleading, and scientifically inaccurate." The letter went on to say, "As the late scholar and U.S. Senator Daniel Patrick Moynihan famously noted: "You are entitled to your opinion. But you are not entitled to your own facts." But what the movie is able to do is give the facts straight from the mouths of over seven former SeaWorld trainers and many more trainers from parks across the globe. "The industry has a vested interest in spinning [whale attacks] so that the animals continue to appear like cuddly teddy bears that are completely safe. 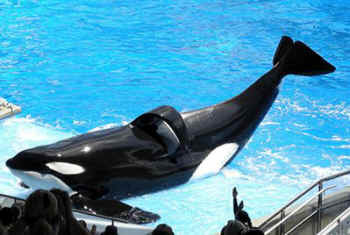 That sells a lot of Shamu dolls and tickets at the gate," said John Jett, former SeaWorld trainer. In its attempt to draw film critics' attention away from the film, SeaWorld's letter instead has been shared widely. And interest in the movie has intensified. "I love the smell of corporate fear in the morning," David Kirby, author of "Death at SeaWorld," commented after SeaWorld released its statement. Much as the Oscar-winning documentary "The Cove" helped to expose the Japanese dolphin slaughter, Blackfish could be the catalyst for real debate about orca captivity. It puts a lot of evidence in the hands of those arguing against the continued captivity and show performance of these orcas.